Fresh venison sausage is much dryer than pork or turkey sausage, so cooking it takes a little extra care. Frying venison sausage so that it does not dry out requires a fat or a liquid. Olive oil adds heart-healthy omega-3 fatty acids and also complements the flavors of the venison and the onions. 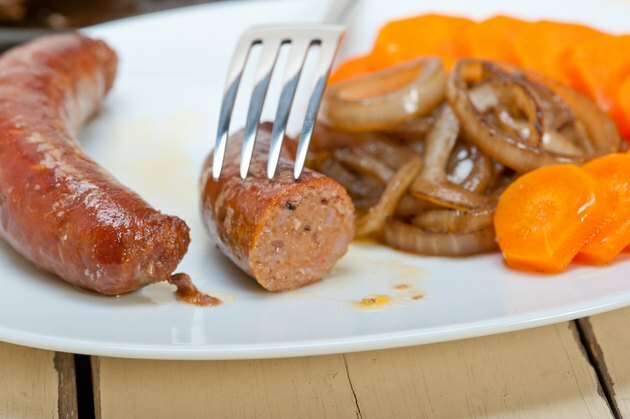 Sausage and onions are a traditional pairing that works especially well in how the natural sweetness of the onions and the rich, gamy taste of the venison complement each other. Heat a skillet over medium heat for 10 to 15 seconds. Add 1/8 cup of olive oil and the deer sausage. Shake the skillet so the sausages don’t stick to the bottom as they start cooking. Cook the sausages for 10 minutes and then add one peeled, halved and sliced onion for every two sausages. Stir the onions so that they don’t stick, and drizzle more olive oil over them if they aren't completely coated. Add a splash of white wine, cover the skillet and let the sausage and onions cook for another 10 to 15 minutes, occasionally stirring the onions and turning the sausages with tongs. Check for doneness by inserting an instant-read thermometer into the thickest deer sausage. They need to reach an internal temperature of 160 degrees Fahrenheit to be safe. Serve deer sausage and onions on crusty rolls with hot relish. Never guess whether venison is done; only a thermometer is accurate.